You are currently browsing the tag archive for the ‘Quebec students’ tag. 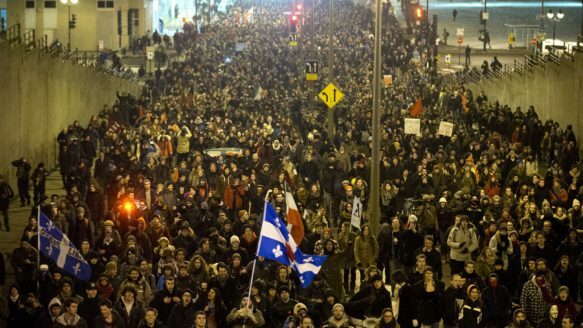 Quebec’s students have returned to the streets. At a recent “education summit”, the new provincial government of Pauline Marois has announced plans to raise tuition at an indexed rate of around 3% per year, provoking a march of around five thousand by the end of the day. Last night, the tradition of night-marches was re-ignited when thousand again took to the streets of Montreal, encountering an army of police with horses, helicopters and riot gear and resulting in at least fifty arrests. Last year, the “Maple Spring” in which striking and protesting students managed to defeat a tuition hike and helped bring down the Charest government captured the world’s attention. At the time, Marois and the PQ supported the protests, and used her first day in office to announce a freeze on tuition. Students saw this as a betrayal, and before long chants of “Partie Quebecois? Partie Bourgeoisie!” were ringing out in the streets. At this, Maclean’s and the National Post seem oddly overjoyed, if only to see the separatists squirm. Marois actions are also coming under scrutiny from a financial point of view. While the increased fees will bring in around $12 million, they come along with cuts ten times that large. The crisis in funding for Quebec’s universities is going to get worse, not better, in spite of these new fees. Similarly, her lack of action on Plan Nord and mining taxes has drawn fire, another issue on which both the PQ and students criticized Charest last year. Last month’s Plan Nord confrence resulted in at least 36 arrests, another episode deeply reminiscent of last year’s showdown. Meet the new boss. Same as the old boss. It’s as if Charest never left, except that Marois herself had marched with the students and worn their symbolic red square. Last year’s election accomplished what armies of riot cops had, for months, failed to do. It effectively ended the protests, giving a sense of at least partial victory (and utter, crushing defeat for Charest). This betrayal threatens to shatter that illusion, and to bring the movement back out in full force. Tomorrow night, another march is scheduled, this time in Quebec City, and it isn’t likely to be the last. Last night around 300 of us marched through the streets of Toronto, from George Brown over to Ryerson banging pots and pans. About 40 of us made the trip from Hamilton in a chartered bus, something that’s becoming quite a trend of late. Both Hamilton and Toronto are holding further “Casseroles” tonight. See ya tonight, 8pm in Gore Park, for my new favourite kind of ‘pot march’. These marches started out as a statement of solidarity with striking students in Quebec and against the draconian anti-protest legislation they’re now facing. As the mobilization starts taking hold, it’s starting to become to become about much more than that. Ontario students pay some of the highest tuition fees in Canada, where 5% yearly increases are becoming the norm. Far too many are leaving school with few job prospects and enormous debts, much like young people who’ve been taking to the streets around the world. Student organizers with the Canadian Federation of Students and others are starting to return from Quebec where they’ve seen first-hand what’s possible. Plans are afoot for a serious organizing drive next fall, with a possible strike vote coming as early as next winter. Whether that’s possible in the dramatically different political culture of Aglophone Canada remains to be seen, but the fact that people are attempting it shows how quickly an action like the Quebec strike can spread to neighbours. Resistance is contagious, and that’s always one of the best reasons to take to the streets. Early yesterday afternoon around thirty students walked out of class at Westmount High School, in an act of solidarity with student strikers in Quebec. This marks the third straight day of local actions supporting the now infamous movement, and a very impressive showing for Steeltown. This past Wednesday night is now being referred to as “Cassarole Night in Canada”. Along with Hamilton, large crowds took to the streets with pots and pans in Kitchener, Toronto, Calgary, Vancouver and others. More actions are planned for next week, with many heading to Toronto next Tuesday night for a march between schools. In Quebec itself, talks broke down again, prompting at least ten thousand at the 38th consecutive nightly Cassarole march in Montreal. As has now become ritual, the march was declared illegal by police, but continued undeterred, with only a handul of arrests in Montreal and Quebec. Today we can expect further talks as well as more from the court challenge of Bill 78. At 8pm tonight you are cordially invited to the corners of King and James downtown to participate in Steeltown’s first “Casserole” demonstration. For those who haven’t been following recent protests in Quebec, these loud and spontaneous marches have become a nightly tradition in the ongoing struggle with their provincial government. The recipe is simple: bring pots, pans and people, then make noise. This tactic is drawn from Chilean protests against the brutal Pinochet dictatorship during the 1980s. It began a couple of weeks ago in Quebec as a way of calling people out into the streets for massive nightly marches and quickly exploded in popularity. As the focus of the struggle shifted from tuition increases to repression of protests, these marches have grown into the hundreds of thousands, undeterred by record-setting mass arrests. Solidarity for the Quebec strike has been spreading lie wildfire, even here in Steeltown. Hamilton also saw another mid-afternoon demo yesterday, much like last week (and likely next week), distributing around a thousand handouts and hanging out workers from the USW 1005, also in the midst of their weekly picketing. Tomorrow there’s a walkout planned at Westmount Secondary. Elsewhere, Calgary is also planning a Casserole tonight and another large solidarity demo is planned next Tuesday in Toronto. In Quebec today, the court challenge of Bill 78 begins today, and negotiations continue between the student associations and the provincial government. The Cassarole was a roaring success, with over a hundred people banging pots, pans, cans, buckets and lids. The crowd was huge, with teachers and students, children, retirees, long-time activists and many who I’d never seen at a march before. The cacaphony of noise echoed around downtown for well over an hour as the crowd gathered in Gore Park and marched around the core. We stopped for brief speeches outside the School board headquarters, which was lambasted for closing schools, returned to Gore Park then decided collectively to march once more and eventually dispersed at the Armoury on James North. A number of bike cops followed intently, but there were no confrontations. What was so remarkable about this demonstration was how it sprung up. Everyone came together following a facebook post a few days ago, by one Mac student, which quickly “went viral” across the city. There was an explicit lack of any planning – the crowd assembled, marched and dispersed organically, with people stepping up to fill whatever roles were required (martialing, flyering etc) as the need arose. The brilliance of spontaneous actions like the Cassarole is that they require very little organizational work for impact they create, and how quickly they can erupt in response to rising discontent. This past weekend in Quebec witnessed a severe escalation of the struggle. Premier Charest passed legislation (Bill 78) targeting the student movement, imposing enormous fines, requiring official notice before any demonstration and ending the semester at affected schools. At least one of the student organizations, CLASSE, has voted to disobey. Conflicts in the streets also escalated, with hundreds of arrests, and fiery street-fighting. Today also marks the date Premier Charest has (finally) declared an inquiry into corruption, as the now-breaking scandal involving Mafia and prominent construction firms threatens to bring down both the Quebec Liberals and Montreal’s municipal government. More local solidarity actions are being planned, as well as proposals for strike votes across the rest of the country and beyond, where tuition fees are already much higher. The exploding international attention now being focused on Quebec, as well as the continued resolve of the students have rendered Charest’s new law shows just how serious a social force students are. Elsewhere, Chile is gripped by similar student unrest, and the deadly suppression of protests at a Syrian university in Allepo have galvanised yet more opponent’s of Assad’s regime. Cracking down on protests doesn’t work, and that’s especially true with students. This is why Quebec has the country’s lowest tuition.